The Lincoln County Historical Society’s Holiday Gathering is a fun and casual mixer complete with rare vintage instruments, played by Brent Bunker. It will be held on Saturday, December 1st from 1:00-4:00 pm. Festivities will take place around the glowing warmth of the fireplace in the Maritime Center’s Great Room and will include festive refreshments and a special holiday musical program by Brent Bunker. Brent will be sharing his extensive collection of old and unusual musical instruments and playing them too! For anyone who has never seen a Ukalin, Harp O Lyre, Tremoloa, or a Marxophone, google it or better yet, take this opportunity to check out, up close and personal, these rare vintage instruments. Attendees to this long-standing community tradition can also check out the museum’s exhibits, the great progress being made on the Doerfler Family Theater project and enjoy the unmatched views of Newport’s Historic Bayfront. Be sure to bring your Christmas shopping list as the gift shop will be offering a Special Holiday Discount only available during this event. 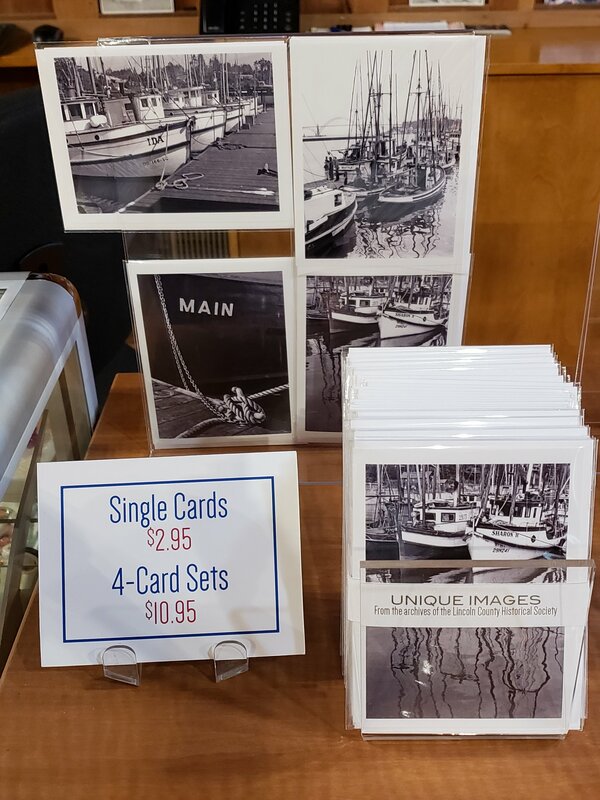 The Maritime Museum gift shop has an outstanding selection of maritime and history publications, as well as locally produced items. The staff and board of the Lincoln County Historical Society would like to share some highly anticipated news – completion of the Doerfler Family Theater is within sight. This proclamation is backed with more than unchecked optimism. Work is progressing nicely – 300,000 lbs of cement has been poured and dried, creating two sets of stairs for 124 tiered seats and an ADA wheelchair lift platform; the heating and air exchange system is nearly finished, and completion of the electrical system, stage, control room and seating area is at hand. The extensive interior wood work will be of reclaimed product from our local forest. The end of these old growth Douglas Fir trees came when they were blown down in the 1962 Columbus Day Storm. The downed trees were recently helicoptered out of a grove atop Cape Foulweather. They are being milled locally at the Siletz River Lumber sawmill. There is not a knot of any kind in this beautiful wood. In the coming months, the combined efforts of Skriver construction, and a dedicated team of volunteers, will install the theater interior wood work. You can do your part to bring this project to completion by adopting a theater seat. For each $300 “adopt-a-seat” donation, a plaque acknowledging your gift will be installed on a Doerfler Family Theater seat. The wording is of your choice — you may acknowledge yourself, a loved one, or perhaps a few words of wisdom or short poem. All finish work should be done by the end of 2018. The 124 seats have been selected and ordered. This will be the last component to be installed. Presently, the seating company is projecting the seats will be installed in the first quarter of 2019. If you are interested in scheduling an event, such as a meeting or theater film screening, we are taking reservations for events in April 2019 or later. The Burrows Museum and staff will host an Open House and annual Autumn Social Friday, October 19th. This casual event marks the 40th Anniversary of the Burrows House as a museum. In 1895 John and Susan Burrows built their Victorian home on a popular footpath that connected Newport’s Bayfront with Nye Beach. The Burrows House was briefly their home, later a rooming house, then spent decades as a funeral parlor. It was moved to its current location, on 9th Street, in 1976 and has been a museum since 1978, longer than any other use of the structure. 5:30 PM: A brief Annual Meeting in the Carriage House. All society members are encouraged to attend and vote on a slate of board officers. A presentation on the history of the Burrows House by LCHS Director Steve Wyatt will follow. 6:15 PM: 40th Anniversary Burrows House Museum Open House. A cookie buffet, cider, coffee, and a special one-day-only book sale with over 100 titles from the gift shop. 60% discount for members; 50% for non-members. 7:00 PM: Log Cabin Tour. Get a rare behind the scenes look at the Historical Society’s vast archives and research library led by LCHS Curator Krissy Sonniksen. This relaxed event is a fun way to spend an autumn evening and learn about local history. Enjoy Burrows Museum exhibits, chat with staff, and mingle with friends, old and new. Admission is free – donations gratefully accepted. The Burrows Museum is located at 545 SW 9th Street in Newport, behind the Newport Armory. Get ready for a treat! The Shifty Sailors, joined by Newport’s Coastalaires, will be performing a fundraiser in Newport on Thursday September 20, 7:00 pm, at the Newport Performing Arts Center. Money raised from the concert will help complete the performing space in the Doerfler Family Theater at the Maritime Museum. Tickets are $15 (12 & under free). The Shifty Sailors have chosen to celebrate Thomas Jefferson’s vision of exploring the Oregon Territory (including what is now Washington and Oregon) at the northwestern edge of the Louisiana Purchase. It also includes honoring not only those who discovered this area by sea, but the many who have labored here as sailors and fishers. Singing together now for 25 years, the Shifty Sailors have followed Tall Ship Festivals throughout Europe, performing in Norway, Estonia, Latvia, Lithuania, Poland, Germany, Denmark, Ireland, Wales, England, France and, most recently, in the Czech Republic. They have sung at a Whale Festival in Hawaii, a Tall Ship Festival in Newport, Rhode Island while touring seaports of New England, and Pacific seaports on the West Coast from Washington to California. Come and enjoy a very entertaining musical presentation while helping to fund theater seats at the Pacific Maritime Heritage Center.